Love Transforms Me (LTM): Nothing else can! No one else will! But the Holy Spirit of God! 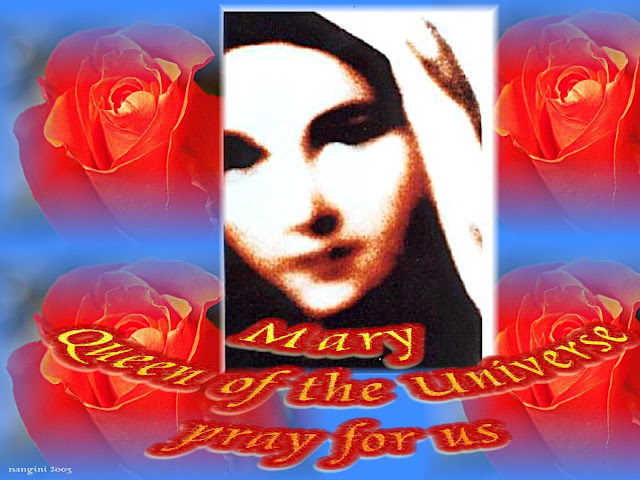 : Holy Mary - Mother of God - Queen of the Universe... pray for us! Holy Mary - Mother of God - Queen of the Universe... pray for us! Happy New Year! - January 1 - 2013 is the solemnity of Mary, Mother of God. "Our Lady came with little Jesus in her arms and she did not give a message, but little Jesus began to speak and said : “I am your peace, live my commandments.” With a sign of the cross, Our Lady and little Jesus blessed us together." On December 28, 2012, Our Lady said to Ivan: "Dear children, also today I desire to call you to joy. Anew I call you to joy! I call you at the same time to responsibility. Dear children, accept my messages responsibly and live my messages, because in the living of my messages I desire to lead you to my Son. All of these years that I have been together with you my finger has been directed toward the Son, towards Jesus. I have a desire to lead all of you to Him. Therefore these days that are upcoming, may your question also be - and I pose this question to you - 'What can I do that my heart may be closer to Jesus?' May this question lead you. Say to yourselves, 'What must I leave behind? What must I reject that my heart may be closer to Jesus? Pray dear children, and I will pray for all of you that your answer in your hearts may be 'Yes, I desire to be closer to Jesus!' Thank you, dear children, for also today having responded to my call." "Dear children, with motherly love and motherly patience anew I call you to live according to my Son - to spread His peace and His love – so that, as my apostles, you may accept God’s truth with all your heart and pray for the Holy Spirit to guide you. Then you will be able to faithfully serve my Son, and show His love to others with your life. According to the love of my Son and my love, as a mother, I strive to bring all of my strayed children into my motherly embrace and to show them the way of faith. My children, help me in my motherly battle and pray with me that sinners may become aware of their sins and repent sincerely. Pray also for those whom my Son has chosen and consecrated in His name. Thank you."